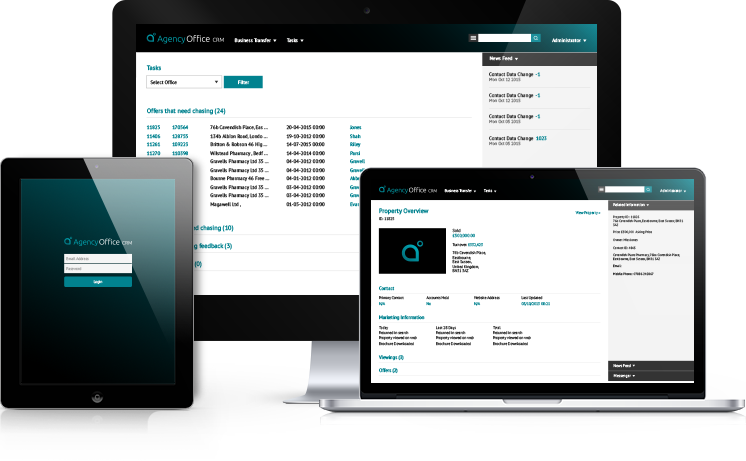 Agency Office provides commercial property agents and business transfer agents with cloud hosted customer relationship management software (CRM), and market leading responsive websites. Cloud based software ensures that you do not have to worry about buying and maintaining servers within your offices. We use the best practice for menu and screen layouts, and provide commonality for ease of use. Fully customisable document, email and mobile message templates, which can be run automatically upon triggered events. A number of mechanisms can be provided to link Agency Office CRM with your company’s existing website, portals and other systems. The search and matching modules built in Agency Office are capable of filtering on geography, size, price ranges and much more. Agency Office’s automated email responders and email tracking are the ultimate add on benefit for time saving and beating the competition to those deals. Our CRM provides agents with a wealth of features, all of which are focused on automation and time saving, allowing you to spend more time managing your client relationships and generating income. Agency Office represents some of the biggest and best agents in the UK, as well as smaller niche operators. The websites we design are all unique, as are our clients, and built in our content management system providing easy build and maintenance - this allows you and us to keep your website current and up to date. We take our work seriously, and we make sure our Agency Office CRM and client websites work as hard as possible for you. All of our client websites are on page 1 of Google.. Contact us today to see how we can make your business work harder..